Guess the junction with near stand entries and the service car stop (with waiting service cars sometimes) ist just to much, if there’s heavy traffic. Though I don’t really know what to report as a bug in this case, as I think it’s more of a design problem myself than a bug. Vehicles which want to drive on the left road, either if they come from the road leading down or they leave the service car stop, will drive the road leading up, doing an 180° turn at the stand entry to turn right into the road leading left. Looks like this is the reason, why this junction is at a higher risk for blocked traffic. Unable to get contract bonuses, bug? 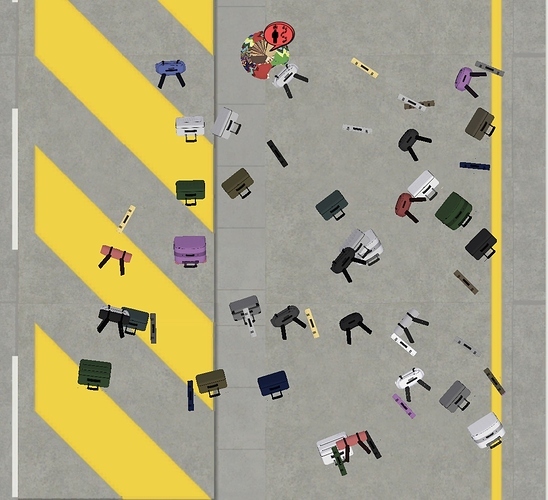 Bug 11504, I am noticing that passengers are just lingering the baggage claim areas never to leave until after a save and reload. Bug 11507, I am also noticing buses (bring people to the world) getting gridlocked again. They only want the same 1 bus stop out of like 20. Bug 11508, I have passengers clustering in one tiny grid box for a security queue (not technically part of the queue yet) and there are several empty securty queues they could use, but no. Now I have to take the airline rating hit on stands that are already being delayed for my issue below. Bug 11509, had a passenger stuck in the security screening process. They were just standing as if they were putting their bag through the x-ray machine. Then there was a cluster of passengers in the tiny grid box just before entering the queue, as is the process was hung up somehow. Also, has anyone noticed their ramp agents take for event to move from the service truck to the belt loader when transferring luggage to the aircraft? They run to the truck once it arrives, then take several game minutes to move. Can’t it be more fluid to not waste time? I have several gates that are always late now because that tips it just over the edge. Just for interest, which gamespeed have you been using? In my experience bugs happen more often in highest gamespeed … there may be a problem with skipping/missing some calculations if there are to much at the same time? I’m always running slowest speed now, I notice it gives me best results. The time in between music are too much. While there are a couple of seconds in some musics (which is normal) some of them have at least coupd of minutes. Sometimes I wonder if music player just stopped. I feel like I keep hearing 3 same songs again and again. Sometimes sound effects also stop working. After a while I start to hear them alongside music. I noticed that deleting wall on secure area while game is on freeze may crash the game. Even demolishing 10 pieces of wall definitely freezes the game for a solid 10 seconds. Also removing wall also removes secure area. Refuel system fails to refuel airplane. Well done. Though it was never supposed to be as large or as that, my oooppppsssss. That’s the size it should have been. Yes, an early sneak peak. It’s still a WIP. Hello everyone, reading through all the feedback and bug reports and stuff now from Alpha 30. Very interesting stuff and big thanks once again for all the feedback! Now begins another week with stabilization, general fixes, and continued work on new features! EDIT: actually, after I did the F10 trick (to clear the nodes) and reloading the game a few times, I haven’t noticed the issue again. When pushing through version 29.12-10 vehicle deadlocks should have been gone, but i’m experiencing more of them. I’ve send in ACEO-11486 for it, where i’ve explained it’s Always when a vehicle is overtaking without enough room for oncoming traffic in the opposite lane. Yes, while the issue has been heavily reduced, there are cases in which the system can still deadlock. Will work on this issue today. Bug 11456 - i have most of my pax heading to the one security check point, not the others. Seems like this issue is also reduced but still occur in some specific cases, will look at this today as well. Did you reduce the ambient sounds somehow? When looking from above at my airport (not the highest possible view) I do not hear anything (music off) except for departing planes. No sounds of planes taxxiing or some people background noise. Yeah, we’ve done a lot of changes here and I’ll happily look through all bug reports on issues like this. There’s many changes and some of them are indeed rough, which is probably why you’re hearing what you’re hearing. Will also be looked at this week. That’s not how it works, the simulation engine can’t skip any calculations as all code is game speed agnostic (i.e. it doesn’t care about the speed). It might feel that more stuff break at higher speeds just because the waiting time between each broken feature is shorter, or that the reduced performance of running large airports on a higher speed makes it seem more laggy, sluggish and broken. I may be wrong of course since I don’t know everything, but from a code perspective I can’t find any reasonable argument why more stuff would break on a higher speed, before deployment we run several tests on various airports and due to time constraints we always run them at triple speed. 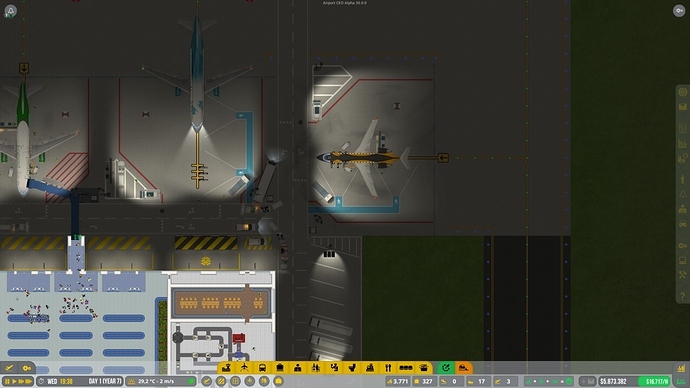 Found some issues with ramp agents being very slooow with baggage unloading and loading handling with a plane. All 4 stand with the service truck / plane but it takes a long time to actually collect bags and then process the baggage, that happens every time. Also only 2 or 3 are actually working instead of 4. People were getting of the bus and tons of messages came in that they couldn’t find a path and they all gather up in one point and just throw away their baggage… I think half of the PAX coming out of the bus had this issue and the other half just walked into the terminal. @ puma; We still could use a task for security staff to clean baggage on the field, for bug reports, the log should keep a counter or something, so it can be traced per session or session block. Bug 11555, I’m noticing (not just on Alpha 30, but earlier ones as well) that if an underground luggage belt runs through a baggage claim area (going to a baggage bay for example), passengers wait on top of it for their baggage, when in fact, their luggage is circling the true baggage claim belt in the area. Can we teach them to ignore underground luggage belts in baggage areas? We had a lot of business stuff to get through yesterday (all postponed to get Alpha 30 out), will hopefully be patching the security check-point distribution bug a long with the vehicle freeze issue this evening. Unfortunately we need another day to verify that the vehicle freeze issue is properly solved. Will update you all in the morning or as soon as we have it verified. Are the intermittent dings I am hearing during gameplay shops opening/closing? I have disabled all but my essential notifications and am still hearing dings with no notifications. Was wondering if its the shops, and if so, how can that be disabled?